A look at the long storied career of Frank Tanana with comparisons to other greats: Nolan Ryan, Don Sutton, Phil Niekro, Lefty Grove, Tommy John, Bert Blyleven, Jack Morris, Jim Kaat. Man, the ’80s were different times. We’re only talking 23 years, but the world sure has changed. For instance, Frank Williams had to work construction in the off-season. Could you imagine a player with decent major league experience being employed as something other than a “baseball player?” I wonder what his taxes looked like. 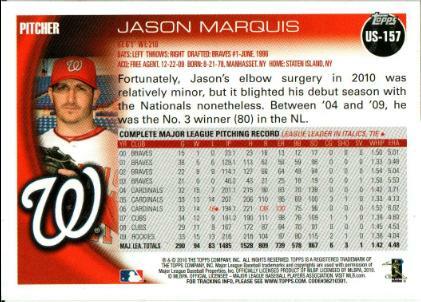 By the time this card was printed, Williams had pitched parts of three seasons for the Giants, totaled 231.2 innings, and posted a 3.22 ERA and 1.27 WHIP. Sure his K-rate declined every year (from 7.70 to 6.66 to 5.68) but he was worth 2.1 wins above a replacement player – not bad for a construction worker. By 1989, Williams would have a pretty decent MLB line: 3.00 ERA, 471.2 innings, and a 1.38 WHIP. Unfortunately, a car crash would end his career and send his life spiraling out of control. He would die of a heart attack at 50 in 2009. My hope is that Williams — wherever he is — gets to relive August 24, 1984. On that day, Williams recorded two relief wins against the Mets. Not a lot of people get to win a game in the majors, let alone two in one day. Congrats, Condolences. I didn’t realize Williams’ tale was so tragic when I began this flip side. If you were thinking of someone who might have a dangerous motor vehicle accident (*ahem* Jeff Kent), you might have guessed it was Eric King. Like Williams, King was a construction worker in the off-season. Also similarly, King earned 1.5 WAR in his first season (going 11-4 with a 3.51 ERA and 1.24 WHIP in 138.1 innings in 1986). His next three seasons would show promise, but, ultimately, be pedestrian (3.90 ERA, 1.38 WHIP, just 5.4 K/9). However, he’d pitch real well in 1990 and 1991 (earning 5.3 WAR) and securing a million dollar payday (let’s hope there was no motorcycle clause in his contract). It was an odd career for King as he’d be out of baseball after the 1992 season. In all, though, he was part of some fascinating trades that included the likes of Matt Nokes, Bob Melvin and Cory Snyder. 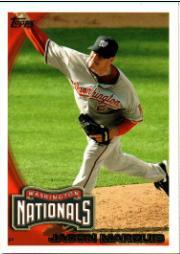 He’d retire with a 3.97 ERA, 1.33 WHIP and 4.8 K/9 in 863.1 innings. While it’s clear being a construction worker was a common occupation for ’80s ballplayers, apparently so was a love of motorcycles. Like King, Danny Gladden (who would later become a memorable golden retriever-like Twin) was a fan of motorcycles. He took it one step further by “[enjoying] competition water skiing and motorcycle racing.” I presume he took part in them, but maybe not. Not surprisingly, Gladden played the game with, what I remember to be, reckless abandon. He averaged 27 SBs and 11 caught stealings from 1984-1990. During that time, he would post a .277/.332/.385 slash line. Still that didn’t quite live-up to Gladden’s promise. He got to the majors late (becoming a full time player in 1984 at 26). That’d be, quite possibly, his best year as well: .351/.410/.447 in 86 games. He’d earn 3.4 WAR that season. I was way too young to remember Gladden as a Giant. 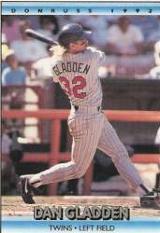 What I remember: Gladden was the Twins version of Lenny Dykstra. Gladden’s play in game seven of the 1991 World Series will be forever cemented in my mind: he stretched a bloop into a double en route to scoring the winning run on Gene Larkin’s base hit in the bottom of the 10th inning of Jack Morris’ game. When he was rounding first, his hair flying, you could almost see him revving his engine.